So, a zuccotto means 'little pumpkin' in Italian. This dessert is traditionally made in a pumpkin shaped mold but can also be made in a freezer safe bowl. It's a layered dessert of cake, which makes up the outer layer. Most of the recipes I came across called for a white or yellow sponge cake. To add my own twist, I baked a chocolate cake in a loaf pan instead. The next layer is vanilla ice cream. Feel free to make your own or if you want to save time, buy it from the store. Last layer (or the center of the bombe) is whipped heavy cream with Nutella and toasted almonds folded in. Then it's all wrapped in plastic wrap and frozen. The longer, the better so that the cake and ice cream layers will hold their shape for serving. This is a great summertime dessert on those hot days and will definitely be one that will impressed your guests! Spray a 1 1/2-quart bowl with nonstick cooking spray. Line the bowl with plastic wrap. Cut the loaf cake crosswise into 1/3-inch-thick slices. Line the bottom and sides of the prepared bowl with the cake pieces, cutting as needed to cover. Reserve the extra slices. 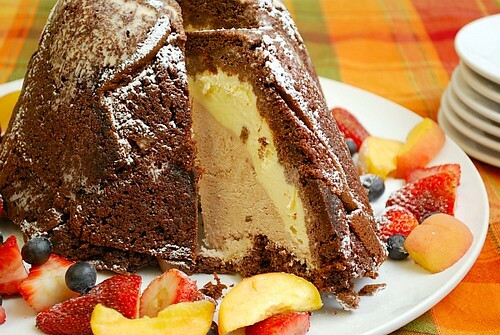 Next, carefully place the softened ice cream inside the cake lined bowl. Spread the ice cream around the sides and bottom of the bowl, keeping a well in the center. Using an electric mixer or stand mixer fitted with the whisk attachment, beat 1 cup of cream until it is thick and fluffy. Fold in the Nutella/chocolate hazelnut spread and toasted almonds into the whipped cream, being careful not to over fold or mix. Transfer this Nutella whipped cream into the filled bowl, right in the well. Fill the well with this mixture and spread over the cake, covering completely and filling the well in the center. Place the remaining cake slices over the filling to cover completely and trimming to fit, if necessary. Cover the cake with plastic wrap and place in freezer for at least 3 hours and up to 1 day. When ready to serve, invert the cake onto a platter and let it sit for a few minutes to soften enough for easy removal from the bowl. Remove the bowl and the plastic wrap. 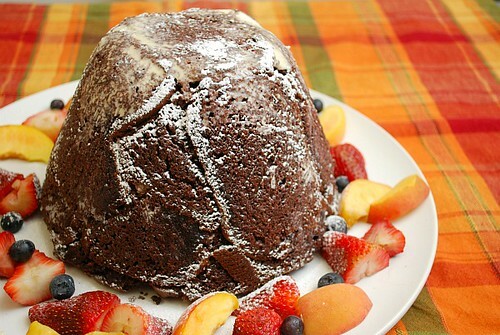 Garnish by sifting powdered sugar over the cake and serve. I just wanted to say THANK YOU SO MUCH!!!! I found your blog through PINTEREST and had to share this page http://joelens.blogspot.com/2007/01/freezer-friendlymake-ahead.html about your freezer meals on my blog. I can not thank you enough..... I have been on the hunt for more exciting ways to pre make dinner and you have been the answer I have been looking for! ok, just I just fell in love! that looks divine! Hi, I found you through Pinterest as well. I made your zucotto last night for a big family Fathers Day meal - it was a HUGE success! Thanks for sharing such a great recipe. At the end, you're supposed to freeze, not refrigerate, for 3 hours, right?